The Internet is, by definition, a collection of networks throughout the world that agree to communicate using specific telecommunications protocols. But this definition doesnt describe what makes the Internet so exciting. The Internet can also be viewed in terms of the people who use it and the ways they communicate with each other to share information and ideas. It is also a place for people to do research, conduct business, and find information that may enrich their daily lives. The major difference between the Internet and other media, such as television, is that it is interactive and provides immediate feedback. We define the World Wide Web to be the collection of information available through the Internet. While many people primarily use the Internet for communicating, either one-on-one or in groups, the World Wide Web is gaining popularity around the world. Since the advent of graphical browsers like Netscape Navigator and Microsoft Internet Explorer, the hypertext environment on the Web has made it easy for people to access information by simply clicking on a hyperlink. These hyperlinks can connect the user to text files, programs, charts, graphical images, and digitized video and audio files. The possibilities seem endless, and the path you take is your own choice. A Uniform Resource Locator, or URL, represents each hyperlink. Web browsers use these URLs to specify the type of Internet service or protocol needed and the location of the item. For example, the URL for the Web page "POPClocks" (at the U.S. Census Bureaus Web site) is http://www.census.gov/main/www/popclock.html. The protocol or service in this case is HTTP, or Hypertext Transfer Protocol, and a Web browser using that URL would contact the Internet site www.census.gov and access the file popclock.html in the directory named www. There are services and tools on the Internet that help you access information, communicate, search for information, and make information available on the World Wide Web. There are services for asynchronous group communication, such as email discussion groups and Usenet newsgroups, as well as services for one-on-one communication. There is also the opportunity to be involved with synchronous communication through chat groups. The amount of information on the World Wide Web is growing at such a rate that it is a challenge to know how to find what you need. To help you find resources, a number of search services and tools have been developed. There are two major types of search tools: search engines and directories. The Internet developed through projects sponsored by governments in the United States and elsewhere to allow researchers to communicate with each other and share results. The initial work began in the late 1960s. There was a tremendous growth both in the number of networks communicating according to the Internet protocols and the number of users accessing the Internet during the 1980s and 90s. There is no central controlling authority that governs the activities on the Internet. However, a number of local laws, acceptable use policies, codes of ethics, and information literacy guidelines are being adopted so that users can use the Internet in a productive and creative way. Want to know how one broswer compares to another? Want to check on the latest version of your favorite browser? There's been lots of material published about using computers for communication. Check out these guides for tips and rules for proper etiquette on the Web and the Internet. Need help writing or designing a web page? Check out the lists of resources at these Web sites. 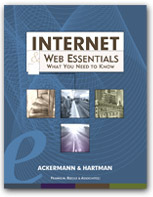 Here are some resources for details about the history of the Internet and the Web.